Returning to the prison after abandoning Carol, Rick finds Maggie as the only person in the yard taking out walkers at the fences. Before helping her secure the fences with the overwhelming hordes, he admits leaving Carol behind and goes to check in on Hershel and Carl. Leaving supplies with Carl, Rick tells him to stay put and protect Beth and Judith. 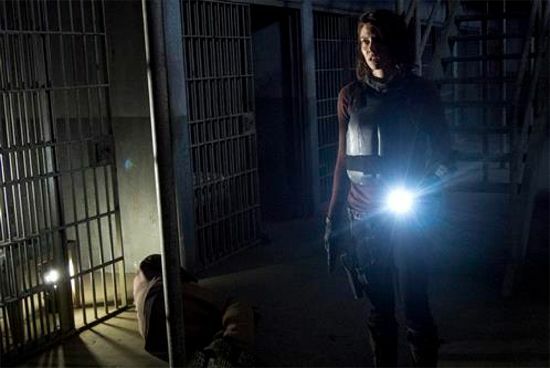 While they get the fences as secure as they possibly can, Maggie and Rick hear gunshots from inside the prison and split up to take care of both sets of needs. 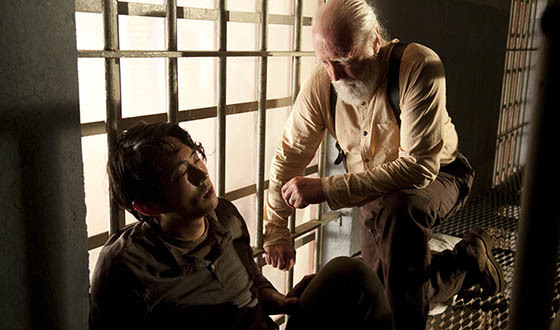 In the sick ward, Hershel is using the help of Glenn and Sasha to manage the flu. People continue to give out, causing them to take the dead away into another room and kill them as/before they turn. Only Lizzie seems to be hanging in there with the flu okay. Hershel also continues to protect Maggie from seeing Glenn in his poor condition. As Hershel tries to hold everything together, he returns to find Sasha passed out on the floor. Getting her set up with an IV, she manages to hold on while others around her begin to turn. It is just at this time that Glenn also collapses and starts coughing up blood. Hershel and Lizzie fend off the walkers as long as they can, including Hershel leading some of them away from the kids with the shotgun from Dr. Subramanian. While Maggie runs inside to save the sick ward, Rick gets Carl and continues to work on the wall until it collapses. As walkers pour into the prison, Rick and Carl get back to their weapons stash and load up their automatic rifles. As the father and son duo mow down the walkers, Maggie reaches the sick ward but struggles to break through. She goes around to the other side and shoots out the window. Taking out a couple walkers, she saves Hershel and helps him get an IV set up in Glenn, sharing a moment as they make it to him just in time. Just after clearing out the walker flood, the medicine team returns to the prison and rushes in with their supplies. The next morning, Bob is helping out with making medicines for the remaining sick. Michonne begins to clean up the walker mess. Hershel finally leaves the sick ward and goes out with Michonne to get some fresh air. While Rick realizes that he needs to talk with Daryl, Carl indicates he needs him, while Daryl goes to find Rick for answers about where Carol is. Meanwhile outside of the prison, the Governor sits in waiting while watching the events of Rick’s survivors. Reaction: The first most obvious thing to mention is that the Governor is back and he appears to have been waiting and watching for some time. Is it possible that he has been leading the walkers to the prison? Are Martinez and the other guy still with him, or has he found other soldiers to fight his battle? It appears that Rick’s group is not going to have much of a chance to process what happened, including Carol’s absence, if the Governor makes his move on the prison within the next episode or two. Hershel has become both the moral center and the hero of the group. While he clearly put himself in danger by going into the sick ward, he single-handedly (mostly) kept people alive as long as possible. When it comes to the characters of the show, none of the people fans are close to died, but most of the people from Woodbury did. It was similar to the second episode when the flu lead to the first massacre of the prison. There was a sense with how they were featuring Hershel that he was going to fall, but they instead highlighted his toughness and made him out to be much more of a survivor than he had be featured in the past. The only other thing that stood out was that he may have ended up questioning his faith for the first time. He still walked away and received respect from both Michonne and Daryl. Rick has been trying his best to preserve Carl’s innocence, but he had no one else to rely on when the walkers threatened the wall. If anything, Carl was the better fighter when the flood came through the fence. He was taking down walkers with much more authority and seemed much more focused than Rick, which could lead to some interesting problems in the near future. Carl has asserted himself as a legitimate fighter/defender, which could play out in an interesting way when the Governor makes his move. The Carol question was only slightly answered but not by the characters we want to hear from. Daryl, Michonne, and Tyreese are still in the dark, but Hershel and Maggie were brought up to speed. Maggie justified Rick’s decision but failed to acknowledge that she would be able to make the same decision if she needed to. Hershel did not acknowledge his true opinion about the decision, but he did redirect Daryl toward Rick at the end of the episode. It is possible that Daryl and/or Tyreese will go after Carol. That may actually take them out of the Governor fight. Tyreese will likely be at the prison when the Governor attacks though, since he will also likely not chase after her. The prison is just about ready to be done, but it looks like we’ve got another few episodes before they end up back on the road. Rick had his moment gardening, but he will not be able to play the farmer for much longer.